A recently passed Colorado Enhanced Rural Enterprise Zone for the San Luis Valley will make it easier and more beneficial than ever for Colorado citizens to donate to the restoration of Engine No. 168. The locomotive, built in 1883, will be the oldest operating steam locomotive running on Cumbres & Toltec Scenic Railroad and will offer visitors something that hasn’t been seen in one hundred years – an authentic 19th century locomotive running on the same tracks it once did during its working life. The Enhanced Rural Enterprise Zone means that all contributions to the restoration receive a 25% Colorado state tax credit. “We have started a donation campaign that now makes it possible to turn every dollar contributed into $2.66 of funds towards the restoration of No. 168,” said John Bush, president of the Cumbres & Toltec Scenic Railroad (C&TSR). Bush explained how it works. “We are asking for contributions of $168 to help restore No. 168. An anonymous donor has agreed to match each donation, so a contribution of $168 automatically turns into $336. Then, because of the enterprise zone, each donation of $168 from a Colorado citizen generates a certificate good for $42 off their Colorado tax bill. That means the contribution of $168, really just costs $126,” Bush said. He added that donations are also eligible as charitable contributions. 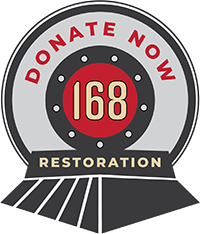 The Engine 168 and Historic Car Project will add a new heritage tourism attraction to the railroad. The project’s plan has it increasing annual ridership significantly, boosting the region’s economy. A 2014 study concluded that C&TS has a total economic impact of almost $15 million in the region. Recent survey data indicates that more than half of C&TS passengers stay at least one night in either Antonito or Chama; others stay in Alamosa and Pagosa Springs. These passengers also reported purchasing breakfast or dinner at local restaurants. The railroad has payroll of more than $1.5 million per year, roughly half of which goes to residents of Conejos County. C&TS offers highly competitive wages and imparts useful job skills. The Engine 168 and Historic Car Project added three full-time jobs in Antonito, a project manager and two rehabilitation specialists. Much work has already been completed on the engine and it is expected to enter service and steam through the Rocky Mountains once more in 2019. The May issue of Trains Magazine has a detailed article on progress made so far. The Cumbres & Toltec Scenic Railroad operates the historic narrow-gauge rail line between Antonito, CO and Chama, NM originally built by the Denver & Rio Grande Railroad in 1880. This line is now a National Historic Landmark that has provided authentic railroading history to hundreds of thousands of visitors over the years. The States of Colorado and New Mexico created the Cumbres & Toltec Scenic Railroad Commission in 1977 to oversee the operation of the Railroad. Its mission is to preserve and develop the Cumbres & Toltec Scenic Railroad for the education, enlightenment and enjoyment of future generations and to facilitate economic development within the communities affected by the railroad.